Abacus believes in improving enterprises by incorporating latest technologies and coming up with the most innovative solutions possible. Being amongst the top technology implementers in business, retail, wholesale and government sectors in a number of countries, Abacus has also built two tech ventures of its own, namely Antlere (Customer Experience Management Software) and Cartright.pk (E-Commerce and Price Comparison Platform). At Abacus, we are committed to playing an important role in harnessing the entrepreneurial culture in Pakistan and have invested in several promising start-ups through our APIthons. If you have an idea that could transform the future, or an app that can change lives, feel free to give us a shout! Being a person with digital skills in the economic climate has never been more lucrative than in this era of the fourth industrial revolution. Abacus, being a future focused organization, doesn’t merely provide professional and technological services but also adds value to businesses by training resources with the skills required in the modern workplace. Mid-Market ERP Practice Professional Services from Abacus Consulting provides a roadmap, integrating your data for a unified view of customer information, inventory levels and other details. It is indisputable that the success of a well-grounded business is rooted in the dedication and efficiency of its administrators who hold the foundation of the corporate world in their steady hands. Abacus is one of the earliest firms to test the waters of corporate consulting in Pakistan; it is, in fact a pioneer in establishing the trend of delegating professional consulting services to provide business transformation solutions in the country. Business processes are re-engineered according to the best practices prevailing in the industry. SAP Business One Solution enable organizations track, monitor and analyze information with a variety of parameters, improve efficiency, and help take accurate decisions. Our consultants possess great industry expertise and business process knowledge that can deliver key strategic benefits of Supply Chain solutions. We assist to identify, design and transform ERP implementation process and transformation. We help improve our client’s procurement, payment and collections operations to achieve better prices, greater efficiency, tighter spend control and improved service levels. We also provide consulting and systems integration services to help solve supply chain planning and execution processes. It's a comprehensive application, which covers all your core operations, giving keen insight so they confidently and informed business decisions can be made. With Mid-Market ERP, virtually all aspects of business including administration, customer relationship management, operations, distributions, and financials become more responsive. Mid-Market ERP helps bring sales, financial management, banking, purchasing, manufacturing, inventory management and customer relationship management all under one flexible and responsive system. Abacus Consulting has a dedicated an entire department for queries regarding SAP for its valued clients that have signed the support contract. The main objective of this department is to help its clients in an effective way and keep track of the solutions provided in order to maintain the knowledge base that would ensure the timely and effective resolution of the queries. With a response time of a few hours, the support request process initiates with an email query being initiated by the client, after which a ticket number is generated. The support staff replies with a solution within a few hours. The query can only be closed, if the client agrees to the provided solution. Keeping track of all the updates and patches running at clients and installing them once new patches and upgrades are available. Keeping track of the Early Watch Alert at all clients. Maintaining a knowledge base of all client queries to solve them in case of recurrence. Providing assistance during the upgrading of Mid-Market ERP earlier versions to 2007A. Providing assistance for all queries and problems faced by the clients. Communications with SAP support team by locking customer messages onto the SAP Portal. Providing assistance with year closing activities. Providing assistance for all third party add-ons running at clients. Providing assistance with the Payroll Add-on developed by Abacus Consulting for Pakistan region. Infinity, the brand representing our cloud services in ERP solutions. 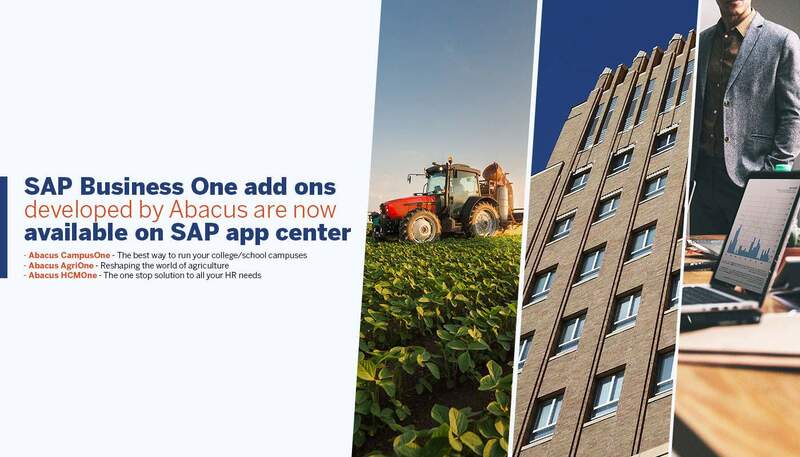 Abacus is offering the managed services of SAP Business One cloud in all available models i.e., IAAS (Infrastructure as a service), PAAS (Platform as a Service) and SAAS (Software as a service). Infinity services consist of, but are not limited to, SAP Business One managed services on HANA and SQL platforms along with disaster and high availability solutions. Our clients enjoy the hassle free uninterrupted ERP services of AWS and other partners.